Combine meat with egg, salt and pepper, mix very well. Carefully mix in onion, potatoes and beets. Shape meat mixture into 6 large flat patties. Melt butter in a large skillet. When butter turns golden brown add patties. Fry until golden brown, turn and fry other side until desired doneness. Serve patties topped with fried eggs. 6 servings. Early in the day make Fruit Tarts or buy them. 6:00 Bon Appetit! Enjoy Your Dinner! * May be done early in the day. 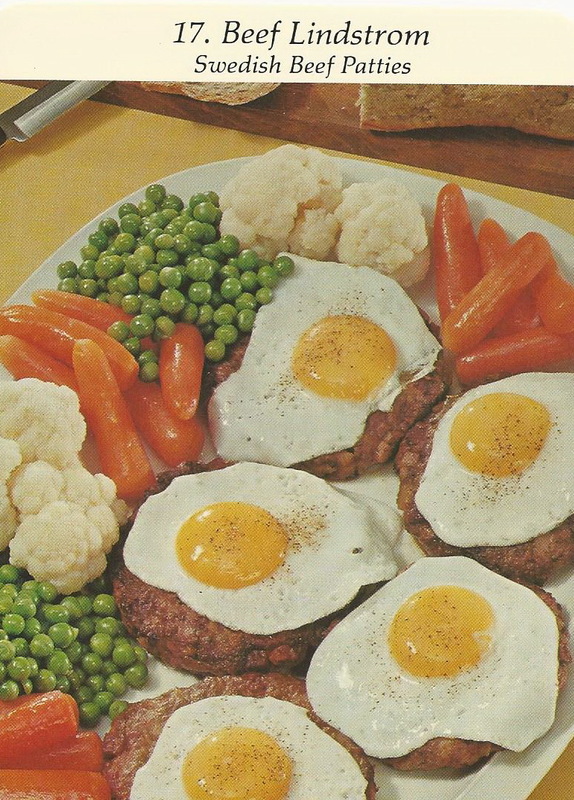 To see what happens when a Steel Town Girl makes this recipe visit Dinner Is Served 1972! ©1972 Marjon Promotions Inc. All Rights Reserved. It’s actually correct. I’m shocked! This actually looks really good. Like Salisbury steak with fried egg.